A few simple tips & tricks to starting your summer garden seedlings. Ideal for beginners and experts alike! Today is a great day to thank a farmer! I love opportunities to recognize the hard work done on farms around the country and there is a lot to celebrate in Canadian Agriculture. However, I will start with a reflection on some challenges facing farming in Canada. In the last twenty years the number of farms has shrunk dramatically and today farmers are scarcer and older than ever before. Between shrinking numbers and more Canadians who live in cities, fewer of us have ever met a farmer. If so many Canadians don’t know about farming I think we are justified in wondering who the next generation of farmers will be. But I have good news! There is a lot of energy and effort going into helping the next generation of our food producers. It is also great that the urban-rural lines that are often drawn between producers and consumers are blurring: more people are growing their own food, going to farmers markets, participating in community gardens, and trying out commercial urban agriculture. The demographics of urban agriculture are very different than traditional farms. Urban farmers tend to be younger, their farms are smaller, the entry costs tend to be low, and they often involve their community as stakeholders or volunteers. The social aspects of urban agriculture are often celebrated. The Garden Patch, for example, is dedicated to teaching people about food production and good gardening techniques. This year 2,300 people visited the garden and many of them left with a clearer picture of what growing food in the heart of the city looks like. It is so exciting when people get inspired to grow their own food or get their hands dirty harvesting food for our Emergency Food Hampers. I believe strongly that we cultivate more than just food, we cultivate community. Something I like to ask people when I give a tour is: “do you know a farmer?” Depending on the group a few people will raise their hands, definitely more here than when I lived in Winnipeg. Then I try to ask some follow-up questions: Have you visited CHEP’s Askîy project? Do you know someone who has a plot in a community garden or allotment? Have you visited the Garden Patch before? Do you know a Beekeeper? These are all examples of growing food and many of them are community focused. I will also remind people that farmers are not mysterious entities. Have you gone to the farmers market? Do you or your parents get weekly veggies through a community supported agriculture (CSA) project? By this time many more people’s hands are raised. Farming takes many forms and I like to keep the definition inclusive. A look at how the land where the Saskatoon Food Bank & Learning Centre Garden Patch now is has evolved over the years. Urban agriculture has a bright future. The opportunities in this dynamic sector of agriculture continue to change and evolve. The Saskatoon City Council recently amended their vacant lot adaptive reuse strategy (VLAR) to make it possible to grow food on vacant lots, you can grow food on boulevards, or keep bees. There are so many opportunities that I have missed that I can only apologize and say you are awesome too! Soon we may see green walls, more edible landscaping and green roofs, a food forest, or a community orchard. The possibilities are endless and there are urban spaces that will produce food in the future that we cannot even grow grass on today. So in closing I hope you take a moment today, or any day this year, and think about the amazing people who grow our food. Some of them live in Saskatchewan, others are a part of a huge global community of food producers. However, the ones I think you will have the easiest time thanking face-to-face are the ones who live right next door. If you're interested in getting more involved in urban agriculture in Saskatoon, consider forming a team and Adopt-A-Plot in our Garden Patch. The Saskatoon Food Bank & Learning Centre Garden Patch has been tucked in for the winter and will spend the next 6 months resting after a busy gardening season! Through out the spring, summer and fall, the garden is a vibrant, growing place, always a buzz. Check out the 2016 Garden Patch Review for a re-cap of the exciting events, workshops and growth that went down at the Garden Patch over this past growing season! 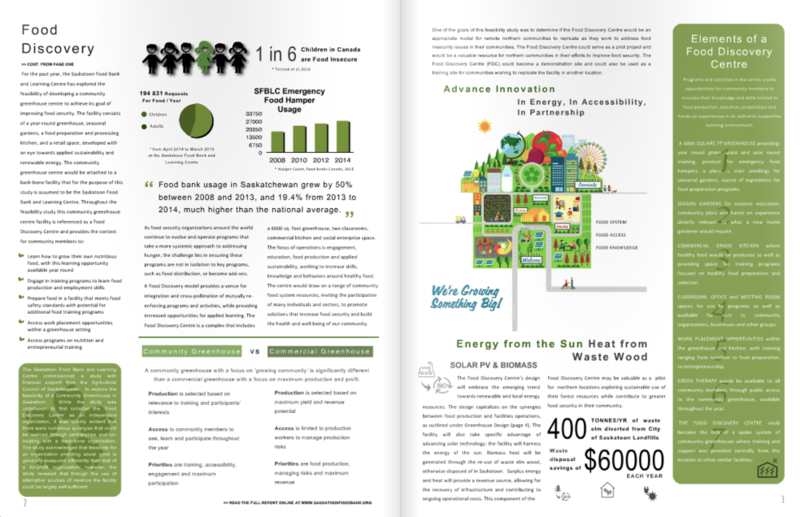 The Saskatoon Food Bank and Learning Centre commissioned a study with the financial support of the Agriculture Council of Saskatchewan, to explore the feasibility of a Community Greenhouse in Saskatoon, referred to in the report as a Food Discovery Centre. Please view the results of our study below, released in November 2015. Read the summary by clicking here! Financial support for this project has been provided by the Agriculture Council of Saskatchewan through the Advancing Canadian Agriculture and Agri-Food Saskatchewan (ACAAFS) Program.